If seeing results in your skin is important to you, we can certainly help! Our Osmosis bespoke facial is completely tailored to your skin's needs. Let our team work with you to completely understand your skin goals and tailor a solution which is unique to your skin, helping your skin create permanent change. To be purchased and redeemed by 30 April 2018. This experience includes a 60 minute bespoke facial with a complimentary 20 minute back massage. Our highly popular deep relaxation experience is back for a limited time. To take some time for yourself, click on the ‘Book Now’ button above or feel free to give us a call on 09 600 1155. To be purchased and redeemed by 30 April 2018. This experience includes a 20 minute foot therapy, a 50 minute re-balance massage with hot stone placements, and finishes with a 10 minute head massage focused on pressure points. Get supple and glowing skin with our Summer Ready Experience. This experience is the perfect balance of beauty and relaxation. If you haven’t yet tried one of our amazing Osmosis facials here is your chance! To take some time for yourself, click on the ‘Book Now’ button below or feel free to give us a call on 09 600 1155. To be purchased and redeemed by 31 January 2018. This experience includes a 10 minute body brush, a 30 minute back massage, and finishes with a 40 minute bespoke facial. With the end of the year fast approaching we saw the need to craft an experience which was centered around deep relaxation. To be purchased and redeemed by 30 November 2017. This experience includes a 20 minute foot therapy, a 50 minute re-balance massage with hot stone placements, and finishes with a 10 minute head massage focused on pressure points. With the warmer months just around the corner it is a great time to start getting back into those essential maintenance routines. 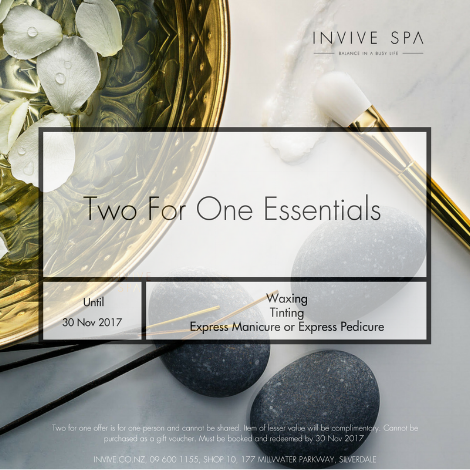 To help with this we have crafted an Essential Balance promotion centred around waxing, nail care and tinting. Click on the ‘Book Now’ button above or feel free to give us a call on 09 600 1155. Please note that our online booking system will not show your discount when booking, we will apply the discount when you come in for your treatment. Item of lesser value will be complimentary. Must be booked and redeemed by 30 Nov 2017. Two for one offer is for one person and cannot be shared. Cannot be purchased as a gift voucher. To welcome the beginning of spring, we’ve carefully crafted a bespoke and nourishing experience which will create space for you to disconnect from the chaos of your busy world and bring balance to your busy life. To be purchased and redeemed by 15th October 2017. This experience includes a 10 minute foot soak, 20 minute stone therapy massage and finishes with a 60 minute calming hydration facial.